The health and nutrition industry tends to hype up more exotic “super foods” from time to time, but that doesn’t mean that the old staples are less powerful when it comes to nourishing the body. The apple is about as common as it comes, but that doesn’t mean that’s benefits are limited. In fact, there are actually a lot of good reasons to snack on one today. Apples are a good source of sustained energy, thanks to the fact that they are a good source of the natural sugar fructose. Unlike processed sugar, fructose take longer to be turned into glucose, so while it will give you a boost of calories to use as fuel, it won’t spike the blood sugar to levels that would lead to crashing. the energy levels are further sustained by the fiber in apples, since that helps to slow down the digestion process overall. Some people like to make the comparison that apples can give you as much energy as a cup of coffee. They work in different ways since caffeine stimulates the fight or flight hormones in your body as opposed to offering a caloric fuel source, but pairing them up for an energy-boosting snack certainly wouldn’t hurt the cause. Since apple don’t spike the blood sugar too dramatically and they can be quite filling thanks the fiber and water content, they have an awesome place in a healthy diet that is focused on sustaining or weight loss. When fiber and polyphenols remain undigested in the gut they actually promote the growth of good bacteria, which then in turn has its ways of helping with weight maintenance such as lowering inflammation in the gut. Apples are also a good source of ursolic acid, which has been reported to boost calorie burn and encourage the formation of more muscle and brown fat in the body, as opposed to the bad white kind of fat. Granny Smith apples have been called the best when weight loss is the goal. They keep the heart healthy. Apples are a good source of soluble fiber, which binds with fat in the intestine to more swiftly remove. That translates to lower cholesterol levels, which reduces the plaque buildup in the arteries, and ensures that the heart is getting the proper blood flow to keep it healthy. 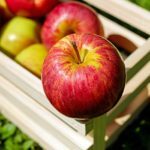 Additionally the skin on apples contains a phenolic compound that has also been shown to prevent cholesterol from solidifying once in the body. They’re a good source of antioxidants.